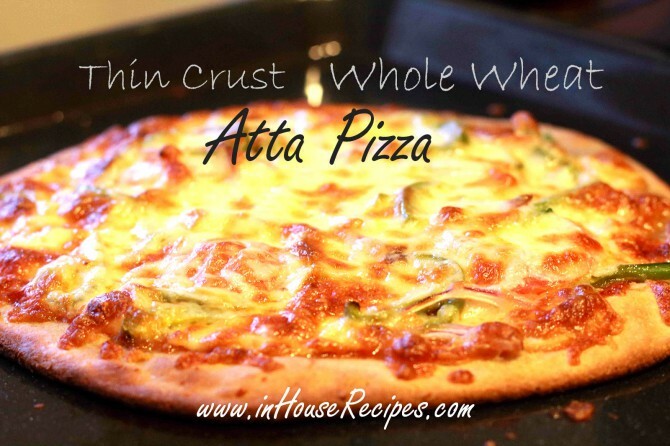 Thin Crust Whole Wheat Atta Pizza is a real treat if you are health conscious. This pizza is made by the whole wheat flour/atta that you normally use to make chapati. We will start with making the Dough for Pizza first. Add Yeast and Sugar in warm water. Mix well and keep aside for 2 minutes. Take a big bowl to making dough. Add Salt, 2 Tbsp Oil, Yeast mixture (from step above) in the flour and mix well. For making a smooth dough, we need to add water gradually and keep kneading it continuously. It will take about 4-5 minutes kneading to get a good smooth dough. Once dough is ready, its time to keep aside it for about 1 and half hour for fermentation. Grease the bowl with 1/2 tbsp of Oil. Now add dough and roll it over once to make sure that the dough is covered with the greased oil completely. Cover the lid of the bowl and keep it aside for an hour and a half for fermentation under room temperature. NOTE: You may have to keep it aside a bit longer if you are making it in winter season. After an hour and a half, open the lid and you will see that the dough has doubled in volume. This means that fermentation Called Khameer Uthna in Hindi has happened. It is now ready for baking. We are targeting to make a medium size Pizza with less than 1/2 inch of thickness. Roll it in round shape with the help of a rolling pin. Add 1/2 Tbsp of Oil in a baking dish and grease it completely. Once done rolling the Pizza, carefully place it into the greased baking dish. Mark Small cuts on the Pizza surface using a knife. This will help cheese melt and reach the inner part of the Pizza bread. The stage is set and the only part remaining is the decoration of our Pizza with toppings. Before we start decorating, lets do some multi-tasking and put on the Oven on pre-heat to save time. Preheat Oven to 400 degree Fahrenheit, this helps in getting the best result in Pizza baking. We will now work on the best part of the Pizza making one of my favorite i.e. Pizza Decoration. Spread the Tomato sauce all over the pizza base except corners with the help of a spoon. To start with, place the Tomato rings. Place thinly sliced Capsicum and Onion too. Now grate the Mozzarella Cheese all over the pizza excluding the corners. We are using Mozzarella cheese, you can use any like Cheddar or Parmesan or a mix of all. It’s up-to you how much you want to eat just drop in the quantity as per your liking . Pour 1/2 Tbsp of Oil all over the pizza topping. By this time, your Oven should have reached the pre-heat 400° F stage. Wear the Oven safe gloves and dig in the pizza in a pre-heated Oven. Bake it for 15 minutes. After 15 minutes, switch Off the Oven and take out the Pizza. Remember to keep your Microwave safe gloves ON. The hot Pizza is ready. Now, Sprinkle the seasoning of your choices and enjoy this delicious Pizza. I always prefer some Oregano seasoning, Black pepper and some salt as pizza toppings. Hope you enjoy and share your thoughts about this Crispy Whole Wheat Pizza.